It is that time again and I don’t like it! Saying goodbye to each intern is heart-wrenching. We sit together at a coffee shop for an inspiring but bittersweet few hours reflecting upon insights gained and lessons learned. These “closing meetings” also transport me back in time to my six years as a student at HUC-JIR. They remind me about the best part of Rabbinical School: the year spent studying for my Master of Arts in Jewish Education (MAJE) at the Rhea Hirsch School of Education. The Rabbinic-Education (“Rabb-Ed”) year at HUC-JIR’s Rhea Hirsch was the most transformative part of my rabbinical studies. Like most colleagues who earned an MAJE degrees at RHSOE, I explain to anyone who will listen that of my six years of Rabbinical school (year 1 in Jerusalem, years 2 and 3 in NY, year 4 as Rabb-Ed, years 5 and 6 in LA), the Rabb-Ed year was the most transformational. My decision 22 years ago to leave my East Coast upbringing after my third year rabbinical studies in New York to travel to the Rhea Hirsch School of Education to study for the MAJE was the most significant, best and long lasting positive decision of my rabbinical career. It provided me with the tools to become the successful rabbi I am today. The importance of the Rhea Hirsch School goes beyond the fact that the Los Angeles campus has gathered together an amazing Education faculty: past directors Sara Lee and Rabbi Bill Cutter, current director Michael Zeldin, and professors Isa Aron and Rabbi Tali Hyman. Rather, this faculty has created a web of HUC-JIR, communal institutions and Jewish professionals which are tightly interwoven to nurture future Jewish educators and Rabbi-Educators. This Education faculty has been purposely trained to bring together the academic study of Jewish education (research, pedagogy, best practices, etc.) with the mentoring of students toward reflective practice and personal growth. They work extensively and closely with the local clinical faculty (internship mentors) to challenge and guide students to become reflective practitioners. During that year, everything seemed so seamlessly integrated. The ideas I was grappling with in readings and class related directly the challenges I was struggling with in my internship which related perfectly with the issues I was facing on my path to become a Jewish professional. That year pushed me farther and made me think more deeply about Judaism and Jewish education, about the synagogue as a system, and about organizational transformation. How did that happen? The RHSOE ensures that the clinical faculty (mentors of interns) themselves study and reflect – individually and as a group – upon their roles as mentors and educators. (I have sat on the clinical faculty for 14 years.) The RHSOE clinical faculty consults regularly with the RHSOE Director and with the students’ RHSOE academic advisors to reflect upon the students’ progress and to partner in guiding growth. Thus, as an intern, more than merely “doing my job” at my RHSOE internship (at Temple Ahavat Shalom, Northridge, CA, under the mentorship of Rabbi Barry Lutz), I was guided to grow in this internship as an educator and a rabbi through focused learning and reflective practice. I was encouraged pointedly and directly to examine systematically all aspects of what I was thinking and doing as a student, an intern and a future Jewish professional. Each partner in my growth process – academic advisor, school director, internship mentor – was trained extensively and repeatedly toward the goal of reflective practice. Thus, the RHSOE has become an integral part of the Jewish community here, uniquely training future leaders, deepening the practice of its alumni, and expecting the commitment to and guiding the continued self-reflection and growth of the internship mentors. At no other time did I receive such intensive mentoring. It has become the model for my own continued professional growth. My experience at the Rhea Hirsch School of Jewish Education now serves as the model for how I as a senior rabbi mentor my education and rabbinic interns, my office staff, my faculty and some of my lay leaders. During these past 13 years at Congregation Or Ami, the RHSOE faculty repeatedly has helped me analyze and re-envision our program and structure. Our successes can be directly linked to my RHSOE education and to continued consultation with this amazing faculty. In the past six years, our young synagogue has earned four of the Union for Reform Judaism’s top five congregational awards – including its Nachshon award for significant steps toward Lifelong Jewish Learning – because of education and mentoring I receive through the RHSOE. These awards, my leadership of this congregation, my three years as chairperson the work of the CCAR Convention Committee, and currently my participation on the CCAR Task Force grappling with interfaith marriage, is informed and deepened by the education and mentoring I received at the RHSOE. My Rabb-Ed year in the RHSOE was the most profoundly transformational part of my Rabbinic training, and continues to have the most significant continued influence on the sacred work I do as a rabbi. So now, as I say goodbye to our interns and prepare to welcome new ones, I can only hope that we – Congregation Or Ami, the Rhea Hirsch School of Education and me as mentor – provided them with the deeply transformational experience that my year at RHSOE did for me. Can We Eat Beans, Rice, Corn and Peas on Passover? When was the last time you remembered something? Did you remember something that you had forgotten, or was it something you just hadn’t thought about in a while? How did you remember? Was it by seeing, thinking, smelling, tasting? What was the memory: hazy, blurry, sharp, clear? It isn’t just scientists and biologists who know that memory is often a complex and complicated process. Our ancient tradition and rabbis knew this as well, and put all their efforts into Passover. Therefore, something as seemingly simple as food becomes a trigger for memory, or a reminder of the past: our own past as well as our people’s distant past as slaves under Pharaoh. Perhaps, what first comes to mind when thinking of Passover’s foods is Matzah. What is it, beyond “square,” or “round”? Boxes of Matzah – that plain, flat, and, well, plain unleavened bread – can most often been seen blocking the path of your shopping cart as your buy gefilte fish and other, tastier Pesach delicacies. Most literally, Matzah is unleavened bread. Symbolically, it is most often seen as a symbol of freedom, that first food eaten by a newly freed people. At the same time, Matzah is also the “bread of affliction,” the bread of poverty. So simultaneously Matzah serves as a warning, or reminder, as well: our Jewish tradition does not equate freedom with wealth. What is Chametz and Why Can’t We Eat It? Of course, we cannot have Matzah, unleavened bread, without it’s opposite: leaven, or chametz. You might find it surprising that the Torah is more stringent about chametz than any other forbidden food! Chametz refers to products made from wheat, barley, rye, oats, and spelt. According to the Talmud (B. Pesachim 35a), these are the only grains from which Matzah can be made, and therefore, strictly speaking, the only ones which are subject to the Torah’s prohibition of eating chametz, or leaven, on Passover. If that helps describe chametz literally, how might be describe chametz symbolically? Have you ever watched dough rise in the oven, or have you ever just seen bread? Dough rises, and what results is “puffed-up,” bigger than before. Full of air – or perhaps full of itself. That is exactly what chametz has come to symbolize. Philo, a Greek-Jewish philosopher, described chametz as “pride,” because leavened bread is “puffed-up.” Removing chametz on Passover from our homes, our lives, our families, is a struggle between who we really are now and who we can be once we strip away all the trappings of self-importance. If chametz is so negative, why do we eat it all year? While it is oftentimes very difficult to be a Jew, the Jewish Tradition does not demand of us that which is impossible. Of course, Jewish Tradition doesn’t prohibit the eating of Matzah after Passover either! What are Kitniyot and What are the Rules about Eating Kitniyot? Just as chametz grows and grows (in the oven), so too did the category of chametz expand. For Ashkenazim (Jews of Eastern European descent), the tradition on Passover has been to not eat foods considered “Kitniyot,” which includes many legumes, as well as beans, peas, rice, millet, corn, and seeds. There have been many reasons Ashkenazic communities refrained from eating Kitniyot. For example, there was a concern that because Kitniyot can be ground to make flour and then baked, one could mistakenly assume that their neighbor was eating chametz. Furthermore, there was concern that chametz grain might get mixed up with the kitniyot, if they were stored in close proximity. This kitniyot prohibition was not accepted by most Sephardim (Jews of Spanish or Arab descent) – but that is not to say Sephardic observance of Passover has been any less meaningful than that of their Ashkenazic neighbors. Why is it, then, that many Jews who might not have done so in the past, now eat kitniyot during Passover? In the recent past, two groups of rabbis have met and, independent of one another, ruled that both Ashkenazim and Sephardim should be permitted to eat rice, corn, and kitniyot during Pesach. Who were these groups, and how did they determine such a ruling? The two groups were the Responsa Committee of the Reform Movement, and the Responsa Committee of the Israeli Conservative Movement. Each Responsum (or rabbinic decision) is available on the internet ( Reform and Israeli Conservative). Why do Two Groups of Rabbis Now Permit Eating Kitniyot on Passover? Detracts from the joy of the holiday by limiting the number of permitted foods. Causes exorbitant price rises, which result in “major financial loss,” and, as is well known, “The Torah takes pity on the people of Israel’s money”. Emphasizes the insignificant (legumes) and ignores the significant (the avoidance of chametz). Can cause people to ridicule Jewish ritual in general and the prohibition against eating chametz in particular. One might think that if this custom prohibiting eating kitniyot has no purpose yet is observed, then perhaps there is no reason to observe other mitzvot. Can even cause divisions between World Jewry’s ethnic groups. May I Still Refrain from Eating Kitniyot if I Want To Do So? On the other hand, there is only one reason to observe this custom: the desire to preserve an old custom. While this desire can be very strong, our rabbinic decisors agreed that this desire does not override all that was mentioned above. However, there will be Ashkenazim who will want to stick to the “custom of their ancestors,” and who will be drawn to that tradition, even though they know that it is permitted to eat kitniyot on Pesach. Remember, this too is permissible, especially in light of Reform Judaism’s openness to all aspects of Jewish tradition. Rabbi David Golinkin concluded the Israeli Conservative Movement’s Responsum by stating that with a willingness to eat kitniyot on Pesach (Passover), “This will make their lives easier and will add joy and pleasure to their observance of Pesach.” It can become very easy to think that observing Pesach represents an unbearable burden: so much preparation, the need to give up chametz and instead eat Matzah – the list surely goes on. We must remember that Matzah is not only the “bread of affliction,” but the symbol of freedom as well! Rabbi Golinkin ends his legal decision with an understanding and insightful directive. He notes that adding joy and pleasure to our observance of Pesach was probably not on our Passover shopping lists – and if it was, did it even make the top 10? Now we have an opportunity to prepare for Pesach with an additional item on our “to do” lists: adding joy and pleasure to our observance of Pesach. May this be a meaningful Pesach for you and your loved ones! Reform Rabbis’ Prayer Works: Rain in Israel after Months of Drought! There are those who believe that if you pray, God brings the rain. Even though I don’t really believe this theology, it needs to be said. Tongue in cheek. Mostly. Israel has had a bad winter, at least as far as rain goes. Not enough. Drought-like season. Shevat 28, 5769, 2/22/2009. Sheer Coincidence?, We wrote that sexual transgression prevents rain from falling in Israel. We said that Thursday night’s mass prayer at the Kotel was to atone for sexual transgressions. Look what happened. It has been raining buckets ever since. Here’s the rub. The ultra-orthodox prayed for weeks. No rain. Then Reform Rabbis gathered en masse on February 23rd in Jerusalem for the Central Conference of American Rabbis convention and voila! It rains. It pours. Now I’m not saying that our prayers brought the rain. But it IS kind of interesting that while various orthodox groups have been praying for rain all season. But when we put our prayers to it, the rain comes. Hmmm… Perhaps if we extended more religious rights to the Progressive Movement in Israel, we could really renew the state, making it clean (of religious corruption), shine (with the light of real Jewish spirituality) and sparkle(with the brightness of social justice). The conference hall was crowded with groups of four as far as the eye could see; the discussions impassioned, the excitement palpable. Hundreds of Jews – American and Israeli, men and women, religious and secular, new immigrants and sabras, right wing and left wing, sat with one another, intensely engaged in the sacred texts before them – studying, challenging and questioning one another and themselves. The Batei Midrash Network, a group of pluralistic organizations dedicated to Jewish learning throughout Israel, hosted this landmark day of learning at the Jerusalem International Convention Center on Friday, the fourth day of the weeklong Central Conference of American Rabbis Jerusalem 2009 Convention. The event brought together Israeli Batei Midrash members and a delegation of the American rabbis for a day of hevruta learning, the traditional mode of Jewish study dating back to talmudic times, involving textual analysis and discussion in small groups. Friday’s hevruta groups, each with two Israelis and two Americans, studied Shabbat, tradition, renewal and Israel-Diaspora relations. With more than 600 participants, this was the largest assemblage of its kind in the history of the young Beit Midrash movement in Israel. For the Central Conference of American Rabbis, the Beit Midrash was symbolic of the growth and success of the Progressive (Reform) Movement, and of Jewish pluralism as a whole in Israel. “People from all over Israel have come to Jerusalem to study with Reform rabbis,” said Rabbi Peter Knobel, president of the Central Conference. Against the backdrop of the state’s refusal to recognize non-Orthodox streams of Judaism, the event demonstrated the solidarity of the worldwide Reform movement, said Rabbi Miri Gold, who is currently embroiled in a fight with the government for recognition as rabbi of Congregation Birkat Shalom in Kibbutz Gezer. “There has been longstanding, unfortunate discrimination, but we’re being proactive, working on advocacy against it,” said Rabbi Yoel Oseran, vice president of international development at the World Union for Progressive Judaism. He said there was “clear evidence” of the movement’s success in its newfound visibility: the large number of wedding ceremonies performed, the Progressive synagogues now in every major city in Israel despite lack of government funding, and the strong growth in their kindergarten programs. “Certainly the Beit Midrash is reflective of the direction of Reform Judaism and its growing embrace of Jewish scholarship,” Oseran said. “The goal of this convention is to engage experientially, in a meaningful way, Israel and Israelis. Today we created the largest national Beit Midrash, and with Torah and love of the Jewish people in common, we hope to forge meaningful personal connections,” said Rabbi Donald Rosoff, chairman of the Central Conference convention committee. The Reform American rabbis from the Central Conference studied alongside their Israeli hevruta partners, united by a dedication to Jewish learning and a belief in its relevance to contemporary concerns. The rise of such Beit Midrash-style learning lies at the heart of Israel’s growing Jewish Renewal (Hithadsut Yehudit) movement (no connection to the Jewish Renewal movement that began in North America in the late 1960s and early 1970s), in which people seek to “take more active responsibility for their Judaism,” Yavin said. From cities to kibbutzim and moshavim, Israel has seen a rise in Jewish Renewal activities: pluralistic study of Jewish texts in batei midrash, communal holiday celebrations and Kabalat Shabbat activities, not associated with specific streams of Judaism. “In the past, Israelis thought that Americans would come here to learn from them. It’s been my experience that Israelis now understand the mifgash [encounter] is two ways, and that’s really inspiring. Lilmod ulelamed [to learn and to teach] each other,” said Michael Weinberg, the Central Conference’s chairman of the Beit Midrash. Rabbi Elyse Goldstein of Toronto, who runs Kolel, one of the few such batei midrash in North America, sees a parallel lack there, and hopes to spur the transplantation of similar institutions overseas. The Batei Midrash Network, which was established in 2003 by five batei midrash, now includes 21 of Israel’s 30 Beit Midrash organizations. More than 3,000 Israelis take part in Batei Midrash Network’s yearlong programs, and 10,000 participate in its short-term programs. It is primarily supported by the UJA-Federation of New York, the Avi Chai Foundation, and the Metro-West Federation of New Jersey. or an ad in an Israeli paper, and watch my face. or God alone was reciting to me. gives me peace no Dante or Milton or Goethe could give. and Virgil sung as if the poet himself were coaching the reader. but remembered to write with Alefs and Zayins and Shins. than all the rhythms and music of Shakespeare. This poem captures one scrumptious aspect of my trip to Israel. Being immersed in Hebrew. Having spent two full years in Israel (post-High School gap year, and first year of Rabbinic School), I learned enough Hebrew to be semi-fluent (at least as far as conversations about eating, politics, religion and day-to-day living). But I was self-conscious enough to let my Hebrew slide. Then, a year ago, I hired a Hebrew tutor to meet me once weekly at a local coffee shop, so that I could talk and hear Hebrew. We graduated to some reading of newspapers and stories. Then she brought me a book in simple Hebrew (Shlosha Yamim Vayeled – Three Days and a Boy) and I surprised myself by plowing through it very quickly. Now as I journey around Jerusalem and the rest of the country, I relish opportunities to speak, read and immerse myself in the Holy Tongue. (I recently wrote about my Love Affair with the Holy Tongue here). It is important to me, as a Jew and a Rabbi, to be able to communicate in our people’s language. So I traded family histories with the taxi driver in Hebrew. I spent a morning studying with Israelis in the Pluralistic Beit Midrash (study session) all in Hebrew. I am tantalized by the Hebrew in the signs for auto parts or housewares. I find myself eavesdropping on the conversations in the Beit Café (coffee shop), because the Israelis’ Hebrew is finally becoming intelligible. The news on the radio, in Hebrew (speaking still a bit too quickly for me), challenges me to deepen my command of the language. Though most Israelis want to speak with me in English, I respond to them in Hebrew. I can pretty much get along solely in Hebrew. Very cool. While English was the main language of the CCAR convention, but true to our commitment to the Holy Tongue, our program committee raised up the offerings in Hebrew. Our CCAR convention offered a plethora of opportunities to study texts in Hebrew, to interact with Israelis in Hebrew, and to pray only in Hebrew. In short, so many American Reform Rabbis are fluent in Hebrew – thanks to our mandatory first year of study in Jerusalem. Because we recognize that the Hebrew language connects Jews everywhere as one people. By the way, the picture is of me and Rabbi Rick Winer (who blogs at Divrei Derech). I’m the good looking one (on the right). K’sheh nichnas Adar, marbim b’simcha. When the Hebrew month of Adar begins, joy is increased! How true, at least from my seat here in Jerusalem. I lay down for my pre-Shabbat schulfee (nap), only to be so filled with memories and stories that I could only sleep for a few minutes. 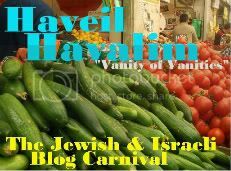 Yesterday, Thursday, was Tel Aviv day. This would be my second full day in Tel Aviv/Jaffa this trip; possibly only my third week or so total in my lifetime. I’m an Oheiv Yerushalayim, a lover of Jerusalem, by nature. When the Psalmist wrote, Eem eshkacheich Yerushalayim – If I forget thee, O Jerusalem – I seem to have understood this to mean that I must remain focused on the Holy City. Yet these recent trips, spurred on by Tel Aviv Progressive Rabbi Meir Azari’s challenge to open myself up to Jewish life outside of Jerusalem, has led me to appreciate, even come to love, this modern Jewish city. We heard Tel Aviv mayor speak of the importance of Progressive Judaism to Tel Aviv. Incidentally, he has been a major supporter of Beit Daniel and its community center, helping allocate land and allocate funds. We took a walking tour of Jerusalem, led by two guides: an Israeli Jew and a Palestinian Arab of Israeli citizenship. Note the new way of speaking about the second: not an Israeli Arab, but a Palestinian Arab of Israeli citizenship. It is about identity. Years ago, many blacks decided to self-identify as African-Americans, instead of blacks, in order to grasp hold of their African descent. As we walked through Yaffo/Jaffa, we learned about the history of the port city from the perspective of two narratives: that of the Israeli Jew and that of the Palestinian. How to reconcile two “truths”? How to honor the reality each experienced, bringing wholeness to both communities? The afternoon was a combined celebration of Israeli/Tel Avivi culture and arts, as well as a reflection on issues of social justice. Any Bar Mitzvah student will tell you that when the Torah instructs us in Leviticus 19:4, “You shall not curse the deaf, nor put a stumbling block before the blind…”, it was urging ethical action toward all those with disabilities. Our actions must be more than just not placing a block; we must work to embrace those with disabilities. Thus, the production of Not by Bread Alone, a play whose theater assembly is comprised of people who are deaf and/or blind. A majority of the actors suffer from an inherited genetic disorder called Usher Syndrome which initially results in acute deafness and which is followed by loss of vision. Their production was moving, engaging and thought-provoking. Rather than worrying about the stumbling block placed before them, these “disabled” actors removed the block that keep so many from seeing “disabled” as merely “differently abled.” Bravo to the CCAR for providing us with an artistic experience, a social justice encounter, and a wonderful day! More reflections on the CCAR conference at Ima on (and off) the Bima (Rabbi Phyllis Sommer), Divray Derech (Rabbi Rick Winer), Desperately Seeking Sinai (Rabbi David Cohen). Also check out the official CCAR Israel Convention blog. Any other CCAR rabbis blogging the convention? Email Rabbi Paul Kipnes, and we’ll link your blog to the CCAR Israel Convention Blog. More than 300 Reform rabbis from North America will convene in Jerusalem this week for their annual rabbinical conference, seeking to bolster the tiny Reform Judaism movement in Israel. The six-day event, which opens Tuesday, aims to strengthen the liberal movement’s ties with Israel and build bridges to its religious and secular communities. The Reform movement in Israel operates 24 congregations, which, like the Conservative movement’s synagogues, are not recognized by the state, and do not receive state funding. “The fact that the largest Jewish community in the world still has not recognized Reform rabbis and Reform Judaism’s institution of learning is something that must be fixed,” said Anat Hoffman, executive director of the Israel Religious Action Center, the legal and political arm of Reform Jewry in Israel. “I want to see liberal Jews around the world break their silence and make their voice heard,” she said, adding that “there was not much room for hope” within Israel on the issue. The gathering of the Central Conference of American Rabbis, which will also focus on Arab-Jewish relations, will include a intra-religious study session with members of all streams of Judaism, and an east Jerusalem tour with “Rabbis for Human Rights,” a fringe group which is most widely known for their vocal opposition to the demolition of illegally built homes in east Jerusalem. The conference will include addresses by both Jerusalem Mayor Nir Barkat and Tel Aviv Mayor Ron Huldai, as well as Labor MK Ophir Paz-Pines. Religious Jerusalem city councilmen from both Shas and United Torah Judaism, which are part of Barkat’s wall-to-wall city coalition and view Reform Jewry as anathema, declined to comment Sunday on Barkat’s scheduled address at the conference. The event will also include the inauguration of the group’s president-elect, Rabbi Ellen Dreyfus, who leads a small congregation in Homewood, Illinois. Dreyfus, 57, will become the second woman to head Reform’s rabbinical assembly. The annual convention of the Central Conference of American Rabbis, which is the representative organization of nearly 2,000 Reform rabbis, takes place in different cities around the world, with Jerusalem serving as host city once every seven years. The last time the conference was held in Jerusalem was in March 2002, when more than 200 Reform rabbis came to Israel at a time of rampant Palestinian suicide bombings. “To return to Jerusalem and Israel for our conference every seven years is an important symbolic statement for our movement in terms of our connection to the State of Israel,” said Rabbi Yoshi Zweiback of Los Altos, California, a participant in the conference who is relocating to Israel this year to head the Hebrew Union College’s year in Israel program. “If Reform and Conservative Judaism want to stay alive in the world, they must take root in Israel,” Hoffman concluded. This country is crawling with Reform Rabbis. They are much harder here to identify then the ultraorthodox ones, mind you, but with the opening of the convention of the Central Conference of American Rabbis (CCAR) beginning on Tuesday, this country is again crawling with Reform Rabbis. (Truth in advertising: there were already plenty of Reform rabbis living here. Through Hebrew Union College-Jewish Institute of Religion’s Israeli Rabbinic program there are a plethora of homegrown Israeli rabbis, and a vibrant American and English rabbinical aliyah has brought numerous Diaspora rabbis to make this country their home. But I refer now to Diaspora rabbis.) Yes, Israel is crawling with Reform (or as we like to say here, Progressive) rabbis. And that’s a good thing, mind you, given that Israelis have – across the board – become so alienated from their Jewish heritage/identity/reality by the inflexibility, sexism and political machinations of the Chief Rabbinate and orthodox religious parties. In ever greater numbers, they are embracing the authentic alternative our movement – T’nu’at Yahadut Mitkademet, the Israeli Movement for Progressive Judaism – offers. This influx of rabbis injects our movement here with a healthy dose of support, during a time in which they are increasingly igniting a passion for Judaism in the minds of Israelis. That’s a good thing, mind you, because since the early 1970’s when HUC-JIR instituted its Year in Israel program, requiring all American Reform Rabbis to spend their first year of study in Israel, our American Reform Rabbinate has become infused even more deeply than ever with ahavat yisrael, a love of Israel. Service to the Jewish people begins with an understanding that being a Jew equals being part of a Jewish people, that the religion is part, but not the totality, of that reality, and that Israel is and has always been central to that identity. Once every seven years, the CCAR meets for its annual convention in Jerusalem. For a few, this is their every seven years return artza (to the land). For many of us, who try to visit Israel every year or so, this is just another excuse to come home to the Holy Land. For our Movement, this is a clear indication of the depth of our connection to Zion. Yesterday, with my small touring group of congregants, we visited the new Museum at Har Herzl (Mt. Herzl, Israel’s national military cemetery). A brilliantly designed, multimedia experience, the Museum makes you feel like you are falling in love – with the once completely assimilated, non-Jewishly connected Theodore Herzl – with the idea of a Jewish State. Which led one of our tour participants to ask why in his pre-Bar Mitzvah Jewish education did he not really come to understand the significance of this movement for statehood. Which led me to explain how education is often lost on the youth. Which led him to ask if he ever really learned about early zionism at school or camp. Which led me to suggest that while most all Reform and Conservative schools teach the history of early Zionism, we in our youth are so caught up in ourselves (and irritated that we have to attend supplementary school in the afternoon after our secular school lets out) that we miss half of what we are taught. Which led to the realization that the best way to instill ahavat yisrael, a love of Israel, is to make it possible for the largest number of Jews to visit the Holy Land. Which explains the critical nature of Birthright and annual congregational trips to Israel. Which explains why, this spiritual ascent to Jerusalem, once every seven years, specially designed for rabbis (and their spouses/partners), is so important. We reconnect with the back alleyways of Israel’s cities, create new kesher (connections) with Israelis across the spectrum, recharge the many facets of our tziyonut (Zionism), and literally fall in love with this country yet again and again. So Israel is beginning to crawl with Reform Rabbis, as more than 300 of us will gather together for our kinus (conference). And while that will give some ultra-orthodox leaders the creepy-crawlies, it illuminates a indisputable reality: that the Diaspora and Israel are connected by a multidirectional umbilical cord infuses us all – Americans, Israelis, English, Germans, South Americans, Canadians, Russians and… – with a rich heritage and a meaningful Jewish future. the time of day the City assumes a touch of the romantic’s magic. and wrote new songs from notes made of beams. not Shelley, nor Wordsworth, nor the grandsweeping Lord Byron. What an inspiring week. Another peaceful transition from one president to another. An affirmation of equality, of hope, of our belief that b’tzelem Elohim, we were all created in the image of God. At times like these, Jews seek words to express the holiness and the hopefulness of the moment. Janethewriter posts Blessings for Today: A New Day in America on RJ.org, the Reform Movement’s blog. We Jews have blessings for all occasions: for bread, for wine, for joyous times, for sad times, upon seeing a rainbow, for flowers and herbs, for social action… the list goes on. Each morning we thank God for returning our souls to our bodies and for a host of other daily miracles: enabling us to distinguish day from night, opening our eyes, freeing the captive, lifting the fallen, and so on. In our minyan this morning, we added three more blessings for the day: Baruch atah Adonai, asher sam chelki b’medinah chofesheet v’democratit. Praised are You, Adonai, Who has allowed me to live in a free and democratic country. Baruch atah Adonai, asher tzivanu lirdof acharei ha’tzedek tokh milui chovoteinu ha’ezrahiyyot. Praised are You, Adonai, Who commands us to pursue justice through the fulfillment of our civic obligations. Baruch atah Adonai, asher tzivanu la’asok b’ma’asei tikkun ha’olam. Praised are You, Adonai, Who commands us to engage in acts of repairing the world. I would add a fourth: Baruch atah Adonai eloheinu melech ha’olam shecheyanu v’kiy’manu v’higyanu lazman hazeh. Praised are You, Adonai, Sovereign of the universe, for giving us life, for sustaining us, and for enabling us to reach this time of joy. Amen.